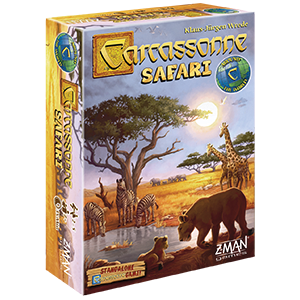 Order Carcassonne: Safari at your local retailer or online through our website today! The sun shines down, making the African plains even warmer. The heat won’t stop you from enjoying your safari though. You've already seen a majestic herd of elephants pass by and you can't wait to see more. You trek into the bush to cool down in the shade while waiting for new animals to cross your path as they make their way to the watering hole. Enjoy the classic tile-laying game you know and love with new twists and a unique location. 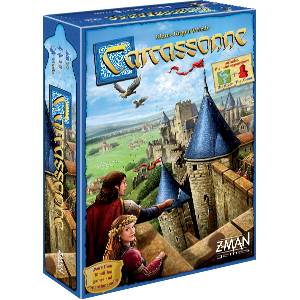 Carcassonne: Safari is available for pre-order now through our webstore or your local retailers today. The African plains are full of many different wild animals. From monkeys to elephants and zebras to giraffes, you’ll discover a variety of species as you explore the landscape. Blaze new trails through the savanna, spotting these majestic creatures. After placing a tile with an animal trail, you may place one of your meeples on that animal trail if no other meeple are present. An animal trail is completed when both ends are closed. The trail can end in the savanna, the bush, or if it loops back onto itself by connecting to the other end. When the trail is completed, it is scored. While adventuring across the trails, you want to see a variety of animals. Points for the animal trails are based on the number of different animals present. Here the blue player places a tile that closes the animal trail. Even though another player placed the tile that completed it, the red player will score points because their meeple is on the trail and they spotted the animals. 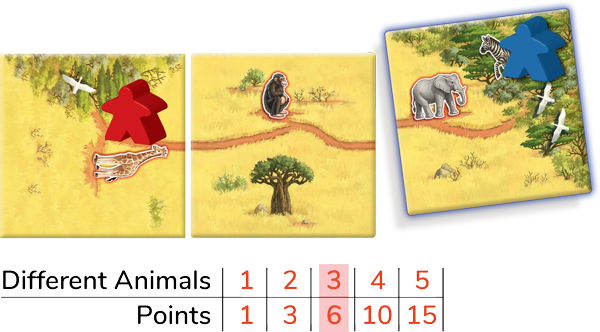 Since there are three different animals on the trail (the giraffe, monkey, and elephant), the red player scores 6 points. The baobab tree stretches high above the African plains, giving you a birds-eye view of the animals across the savanna. When placing a baobab tree, it must continue the existing landscape. After placing the baobab tree, you may place a meeple there to get a better view of the savanna. If you place a meeple on the tree, take two animal tiles. There is much more to see! Continue exploring the savanna and spotting new animals. Once all eight spaces around a baobab tree have been filled in with new land tiles, the feature will score. eturn your meeple to your supply and draw two more animal tiles. In the early morning when the sun was just rising, your group piled into the ranger and drove out to the perfect spot in the African plains to begin your safari. The animals may shy away from the ranger though. While exploring the savanna and the bush, moving the ranger to a new location will let the animals roam where the ranger was and will score you additional points. If you place a tile on a space occupied by a ranger, remove the ranger and place it in front of you. You may then place a meeple on the tile you placed. If you have completed any features with the new tile you placed, those will score. Displacing the ranger scores 3 points. After scoring, place the ranger on an empty space adjacent to one or more tiles. Watch the majesty of nature unfold in front of you and pre-order your copy of Carcassonne: Safari today.